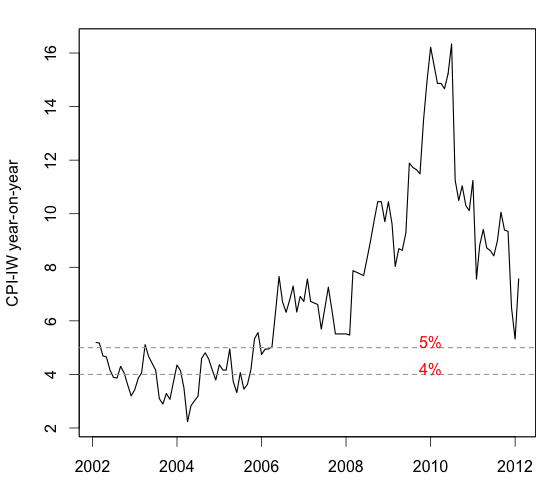 aren't we too lenient when we say that inflation should down to the comfort zone of 4-5%? Given the average inflation in the last 6 years has been upwards of 8-9%, isn't it the RBI / govt's duty to bring the inflation down to 2%, or maybe lower, for some time so that the common man can atleast afford what he could 6 years ago? What is the optimal rate of inflation to target? In the models, lower inflation is always better, but I feel that to some extent, this is an artifact of the way the models are structured. As far as I know, the global convergence to the magic number 2%, as something that central banks should target, happened through thumb-rules and practical intuition. It doesn't easily drop out of the analytics. In the global crisis, many central banks hit the zero lower interest bound: the policy rate can't drop below 0%. This forced them to be inventive and come up with schemes for quantitative easing and such like. This is a mess. I feel it's better to target 4% so as to have greater headroom away from 0, to further reduce the number of times per century that you have to resort to messy schemes. Isn't it a problem if economies today can't handle deflation at all. Sure, liquidity trap and all is bad, lower growth in emerging countries is bad. But, is deflation bad in developed countries where growth really isn't needed all that badly as compared to developed economies? Of course its bad today with all the leverage - there is no option. But, why does economic theory call for an inflation target during normal times? Why isn't natural credit contraction ok? Bad creditors have to fail at some point in a business cycle, is it not? The technology sector has been undergoing immense deflation and that's not bad for the economy (in the context of developed economies), how does one factor that in? I think you are thinking that there is some positive link between inflation and growth. The only time when a Philips curve fit the data was in the US in the 1960s. For the rest, increased inflation and increased inflation risk are damaging for growth. For a developing country, if you think the welfare consequences of low growth are really bad (e.g. social unrest in India at 4% growth while in the US 4% growth would be just fine) then you should be all the more passionate that in India, we should get to low and stable inflation, which is the best possible environment in which to obtain high and sustained GDP growth. Deflation, though, is an entirely different beast. It is possible to get horrible things out of fairly reasonable models if you get deflationary expectations. E.g. why buy a toaster today when it'll be cheaper tomorrow? Inflation targeting is a two way street: The central bank that has an inflation target of 4% fights to keep inflation from going up beyond 4%. It equally fights to prevent inflation from going down! This central bank will pull out all the stops to prevent inflation from dropping below target. Look at the US Fed today - they are targeting 2% and doing all sorts of unorthodox things in order to achieve this. If they didn't, the US today may be at 0% inflation or lower. Are you sure "The only time when a Philips curve fit the data was in the US in the 1960s" ??? To paraphrase Subramanian Swamy "learn some macroeconomics". "If Chairman Bernanke were in the room, I would respectfully ask him why this persistent harking back to the Great Depression? It is one cyclical episode, but there are many others. I myself draw more instruction from the depression of 1920-21, a slump as ugly and steep in its way as that of 1929-33, but with the simple and interesting difference that it ended. Top to bottom, spring 1920 to summer 1921, nominal GDP fell by 23.9%, wholesale prices by 40.8% and the CPI by 8.3%. Unemployment, as it was inexactly measured, topped out at about 14% from a pre-bust low of as little as 2%. And how did the administration of Warren G. Harding meet this macroeconomic calamity? Why, it balanced the budget, the president declaring in 1921, as the economy seemed to be falling apart, “There is not a menace in the world today like that of growing public indebtedness and mounting public expenditures.” And the fledgling Fed, face to face with its first big slump, what did it do? Why, it tightened, pushing up short rates in mid-depression to as high as 8.13% from a business cycle peak of 6%. It was the one and only time in the history of this institution that money rates at the trough of a cycle were higher than rates at the peak, according to Allan Meltzer. Why don't economists of today, in the developed world, not conclude that a quick, perhaps deep deflation is exactly what the markets needed in 2008/2009/2010? Isn't it clear now in hindsight that if the decline would have been deeper (and more importantly debt was written off faster and in greater amounts), that the recovery would have been cleaner and not so fragile? Oh I forgot, the lobbyists and corporate interests have too much control and people are wimps these days. People won't buy anything if prices fall - sure, they won't buy for some period of time (and perhaps they shouldn't be buying crap anyway), but then activity will come back at the end of the cycle as it always does and much of the excesses in the corporate world will be gone. What about this seemingly commonsensical, layperson argument do economists disagree with? And, then, isn't it the case that consumption does need to decline in the developed world. So, again, why are deflation and bankruptcies "horrible"? In any case, seems like all the easing is leaking into emerging markets who can't take it anymore. The end game should be coming up quickly. It'll be fun to watch. This is what I don't get about the toaster example: computers/tablets/mobiles and perhaps even toasters indeed have been getting cheap every year. I just don't see what horrible thing came out of that persistent deflation? It hasn't spelled disaster for electronics makers. Deflation in fact is a natural outcome of progress. The worry on debt flows is far more on the final outcome with GAAR, and similar steps into uncertainty taken by the Govt. than with a puny interest rate differential. The question the RBI faces today is not that if it should cut rates at all, but what happens to the investment cycle if it does not. To be sure, the responsibility of growth, inflation and a myriad other roles is something the central bank has taken it upon itself (and it need not, inflation targeting is good enough), but now that it has, there's little room in continuing with the current rate structure. You say inflation is not under control, and cite the CPI figures as an example. What about the WPI? Something the RBI professes to use? And there too, the so-called core-inflation is down to 5% levels, and the rest of the components, viz., primary and fuel, are not really in its control. I should perhaps put it better: demand for these items utilizes lower levels of financing than core inflation, and along with the rest of features (import-parity pricing of fuels, delayed pass-through, etc. ), makes it difficult to be dealt with using conventional tools, which incidentally also do a lot of collateral damage. This is the time to take hard decisions on supply--side dynamics in the economy, and not just depend on central bank rate economics to control inflation. I heard you on inflation today (18-Apr) on CNBC. Enjoyed your opinion and was sinking quite well the way you explained bits. You mentioned that you do not buy gold in spite of the fact that you see inflation escalating with recent RBI move. Now for a layman like myself, investment in gold is the easiest way to protect your assets against inflation. Kindly explain what is a better way to prevent net asset value erosion from inflation.